If you’re currently selling your products on HomeDepot.com, through the Your Other Warehouse or Direct Fulfillment program and need a warehouse that can automate the process, Shipvine is for you. 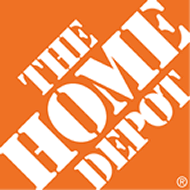 We take the hassle out of shipping for Home Depot so you can focus on your business. Please note that Shipvine is not affiliated, nor a partner with Home Depot. 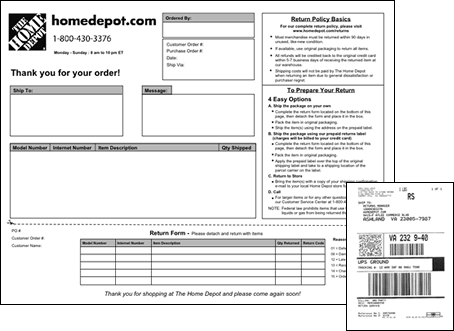 Each order contains the Home Depot packing slip and UPS return label with instructions. Items are boxed and shipped on the Home Depot UPS account number directly to the store or the customer's address. I want to sell on HomeDepot.com can you help me get setup? No, we do not work directly with Home Depot and are not afiliated with them. You’ll have to do that part on your own. I’m currently downloading the PDF version that Home Depot provides. Can you ship with just that? Technically yes, however you would have to manually type the order into our system. If you have more than a few orders a week this becomes very combersome. Do you process the returns for Home Depot? Yes, we process your returns. However, you will still need to log into your Home Depot account for final processing. Our system can notify you whenever you receive a return. Can I share my inventory with Home Depot, my web site, my B2B customers and Amazon? Yes, yes, yes, and yes. With Shipvine you can have multichanal distribution with ease. Who is the 3rd part EDI processor? Why doesn’t Shipvine directly support EDI? EDI is a legacy communication standard, which at some point will be replaced industry wide with XML. We have elected not to spend valuable resources on a technology that most agree has a limited life. XML is the modern standarded for business to business data transfer.